We have talked before about different ways to help Dong communities improve their standard of living. Several methods of doing this are already in action among the Dong people: building schools, providing textbooks, health education classes, flood disaster relief, and much more. Probably the most devastating and prevalent problem for Dong communities is fire. It destroys entire villages, cultural monuments, keeps children from returning to school, and even worse. The DongTeam Journal has breeched the fire topic before, and this is only a continuation of the same thought. Location of the former Dudong drum tower. 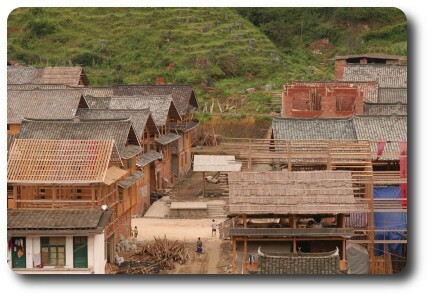 At the top of every DongTeam.org page sits a pleasant photograph of a Dong drum tower from Dudong in Sanjiang County. That very drum tower is now ashes. More than 100 homes were lost in that fire, taking a beautiful example of Dong ingenuity with it, only four years after being built. That emtpy spot in the middle of this photograph, in the middle of all the new houses...that is the former Dudong Drum Tower. Sure, drum towers are not more important than people's lives or homes, but this is just a very clear reminder of the prevalent problem of fires in Dong villages. The Chinese government is already quite active in several different fire prevention campaigns, and one in particular is a simple and effective way to try to keep these fires from spreading. For about US$1,500, the government can supply the concrete, rocks, and piping to build a highly positioned water tank supplying water for pipes lain throughout the villlage. In the event of fire, water under pressure is available from several points around the village. Easier than buckets! And there is nothing to say the government is the only body that can fund these. This may be an excellent way to minister to our neighbor, to help whole communities with a pressing need, and show Christian love to the Dong people.